Over 78% of Russell voters securely cast their vote online using Scytl Online Voting during the 2014 By-Election for mayor. Scytl has been a great partner. Everything ran very smoothly, results were delivered quickly and the election was a success. Scytl, the worldwide leader in secure online voting and election modernization, today announced that the Township of Russell utilized Scytl’s Online Voting solution to conduct a flawless 2014 Mayoral By-Election. Voters were able to securely cast their vote either online or using the telephone. Over 78% of voters opted to cast their ballot online and the remainder voted via telephone. Russell changed from traditional paper voting methods to Scytl online and telephone voting for the first time during the 2014 Municipal elections held in October. 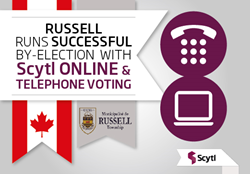 The Mayoral By-Election was the second time Russell used Scytl Online and Telephone Voting. Scytl Online Voting not only improves accessibility for persons with disabilities, but also offers greater convenience by enabling people to vote from any location using a laptop, tablet or smart phone. The Scytl platform ensures voter privacy and ballot secrecy and confirms that the election results are accurate. Scytl’s solutions incorporate election-specific cryptographic security technology that is protected by more than 40 international patents and patent applications to ensure security, transparency and auditability. In addition to the highest levels of security, Scytl Online Voting also provides end-to-end verification ensuring the vote has been cast-as-intended, counted-as-cast and recorded as cast.